EDMONTON, AB. 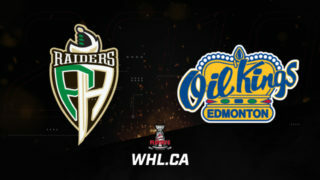 – Ron Robison, Commissioner of the Western Hockey League today, via webcast and teleconference, officially launched the 2007-08 WHL Regular Season from Edmonton, Alberta, home of the WHL’s expansion franchise, the Edmonton Oil Kings. The WHL opens its 42nd regular season on Thursday, September 20th as the expansion Oil Kings play host to the Kootenay Ice at Rexall Place. rWith the addition of Edmonton, the WHL expands to 22 franchises this season as the Oil Kings join the WHL’s Central Division. The WHL Regular Season schedule will get into full swing on Friday, September 21st with a total of nine games. rThe WHL is also pleased to announce the Shaw TV Broadcast Schedule for the upcoming WHL Regular Season. Shaw has served as the official regional cable broadcaster of the Western Hockey League for the past three seasons. Broadcasts on SHAW this season will feature 28 regular season games and extensive playoff coverage beginning with the WHL Season Opener in Edmonton between the Oil Kings and the Kootenay Ice. rWHL WEB-TV is back for another season with the WHL’s Internet streaming partner INSINC. WHL WEB-TV allows fans to watch all of the WHL’s 792 regular season games. 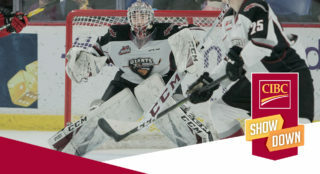 WHL WEB-TV gives the opportunity to view up to 35 LIVE WHL games a week with the same quality service viewers have come accustom to with WHL WEB TV. 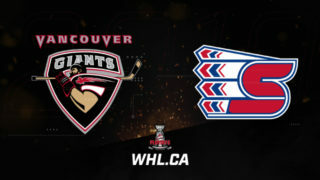 Click the WHL WEB-TV icon on www.whl.ca to catch all the action. rThe 2007-08 WHL Season will be highlighted by two familiar CHL showcase events. The 2007 ADT Canada Russia Challenge Series, featuring Team WHL versus the Russian Selects, will take place on Wednesday, November 28th in Kootenay and Thursday, November 29th in Medicine Hat. The expansion Edmonton Oil Kings will have the pleasure of hosting the CHL Home Hardware Top Prospects Game on Wednesday, January 23. This showcase event features the CHL’s top rated prospects from the QMJHL, OHL and WHL. rAs in previous seasons, the majority of WHL games will be played on weekends. Of the 792 games, 573 are scheduled for the weekends, with 225 to be played on Fridays, 237 on Saturdays and 111 on Sundays. Additionally, 7 weekday games occur on various holidays throughout the season, resulting in 73% of the WHL Schedule occurring on weekends or non-school days. rThe 2007-08 WHL Regular Season concludes on Sunday, March 16th and the 2008 WHL Playoffs will begin on Friday, March 21st. 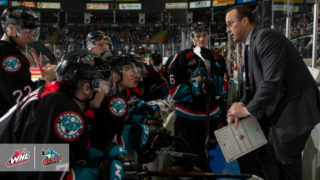 rThe Western Hockey League will be implementing a new playoff format for the 2007-08 Season. The WHL’s Eastern and Western Conferences will use a Conference playoff format for the upcoming year. The first place teams in the two Divisions in each Conference will receive the top two playoff seeds based on regular season points. The next six Clubs in each Conference, based on regular season points, will receive the 3rd – 8th playoff positions. The Clubs will be paired 1 vs. 8, 2 vs. 7, 3 vs. 6, and 4 vs. 5 in a best-of-seven series. rThe first place Clubs in each Division will be guaranteed the top two playoff seeds in the first round. As in previous seasons, the format for the remaining three rounds of the WHL Playoffs will remain the same. The four Clubs winning first round series in each Conference will advance to the second round, where they will be ranked in order of regular season points. The Clubs will be paired 1 vs. 4, and 2 vs. 3 in best of seven series. 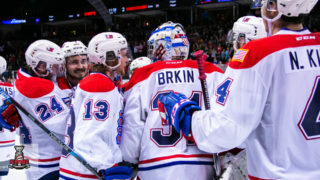 rThe two Clubs winning the second round series in each Conference will advance to the third round (WHL Conference Championships), where they will be ranked in order of regular season points. The Clubs will be paired 1 vs. 2 in a best of seven series. 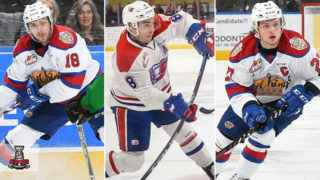 rThe Eastern and Western Conference Champions will advance to the best of seven WHL Championship Series, with the Club having the most regular season points receiving home ice advantage. rThe coveted WHL Championship trophy was renamed the Ed Chynoweth Cup in May 2007, in recognition of the contributions made to the League by past WHL President and current Kootenay Ice President and Governor Ed Chynoweth. The WHL Championship trophy, previously referred to as the Presidents Cup, will be presented annually to the WHL Champions commencing with the 2007-2008 season. Ed Chynoweth has been associated with the WHL for the past 36 years, serving as the WHL President from 1972 to 1995. Mr. Chynoweth also served as President of the Canadian Hockey League (CHL) for 20 years from 1975 to 1995, and was elected to the Alberta Sports Hall of Fame in 2000.
rThe OHL and the City of Kitchener will serve as the official hosts for the 2008 MasterCard Memorial Cup. The Kitchener Rangers will host the WHL Champions, Ontario Hockey League Champions and the Quebec Major Junior Hockey League Champions from May 16 – May 25, 2008.
rThe WHL would like to thank its prestige partners Kal-Tire and Meyers Norris Penny for their continued support of the Western Hockey League. The WHL would also like to recognize its official partners Waste Management, Husky, Sobeys, Boston Pizza and NAPA.